Precision Engineered and machined with State of the Art CNC (Computer Numerical Control) Machining. Simple changover procedure allows you to switch products and/or speeds in seconds. Easy to load product utilizing adjustable, triple-roller guide wheels. Spring Loaded drive tension with one drive wheel and one idler wheel to enhance pulling action. Polyurethane coated wheels so your tubing doesn't get scratched..
Up to 99 stored standard programs with up to 30 additional “batch programs”. each “batch” program can contain up to 10 standard programs. ¼” X 3” opening aperture. Stainless Steel wheels available in lieu of Poly wheels at no extra cost. 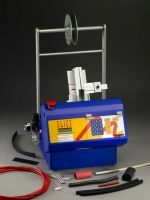 The Model 135 shrink tubing cutter will cut up to 13,000 4 inch pieces in 1 hour! With an input space of 3" x 3/16", you can cut a wide range of tubing sizes at feed rates ranging from 1" per second up to 30" per second. 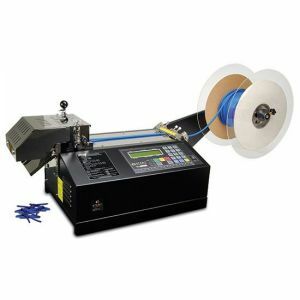 Machine comes equipped with polyurethane coated feed wheels (to keep your polyolefin heat shrink tubing from getting marked or scratched), and all air filters and regulators. Standard cut accuracy +/- 1 mm. Cuts adhesive-lined heat shrink tubing, basic polyolefin heat shrink, and many other types. Tubing sold separately. Please contact us if the option you want is not shown on the website. Every model carries the same one year warranty on electronics and mechanical elements (exclusive of blades or poly-wheels) or one million cuts, whichever comes first.